Brian Wilkie and Mary Lynn Johnson. 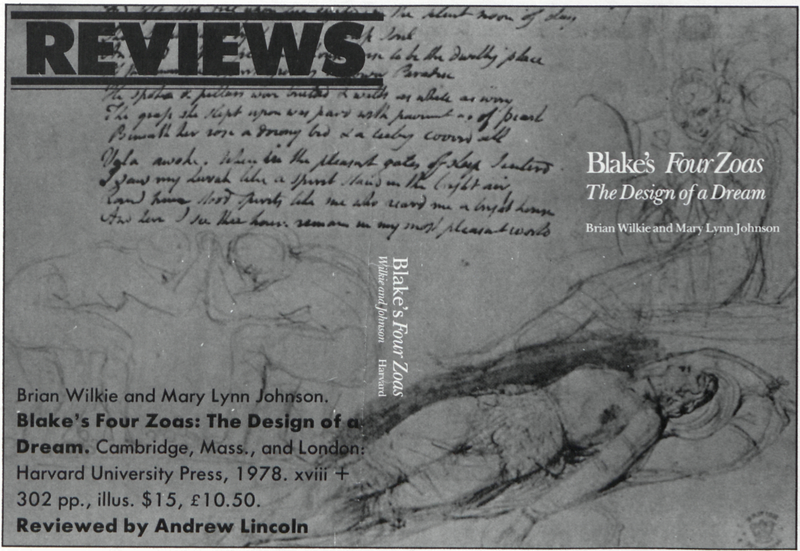 Blake’s Four Zoas: The Design of a Dream. Cambridge, Mass., and London: Harvard University Press, 1978. xviii + 302 pp., illus. $15, £10.50. In the introduction they suggest that The Four Zoas presents unusual problems for the reader because it “seems to exist without a context.” This view of the poem is reflected in the organization of their study: a blow-by-blow commentary, with one chapter devoted to each Night. In practice, the poem’s relationship to Blake’s other writings, to the work of other Romantics, to contemporary history and to other myths is dealt with in passing, as occasion arises. This kind of commentary has obvious advantages: it encourages attention to detail and it serves to meet the reader’s difficulties at every point. But it does have some disadvantages. Continual paraphrasing is needed which, inevitably, becomes mercilessly reductive in places: “Tharmas says that his emanations are lost, then that he has hidden Jerusalem, then that Enion has abducted her, then that he has taken Enitharmon in and cannot cast her out, then that he has accepted as refugees the Emanations of the other Zoas who have been striken dead.” A sentence like this seems more likely to discourage the reader than help him. A more serious difficulty arises with the need to clarify the relationship between elements which stand far apart in the narrative sequence, but which stand together thematically. The authors point out that readers of the poem “are expected to keep suspended in their minds, for hundreds or even thousands of lines, motifs and images that will not be resolved or entirely clarified until near the very end.” But this difficulty is not entirely overcome in the commentary. The role of divine providence in the poem is a case in point. In the chapter on Night I the authors comment briefly on the “hints of an elusive-to-define providence” in the work, but a full discussion of the status of the Council of God is deferred. In the chapter on VI we learn begin page 265 | ↑ back to top that “Blake sets up an ambiguous relationship between the divine will and human perversity, one that seems not to implicate God in the evil he allowed when he might have intervened.” In its context this statement seems fair, but what is the reader to make of the passage in IX where Many Eternal Men appear, who do seem to be in some way implicated in the fall of Man (“we cast him like a Seed into the Earth / Till times and spaces have passd over him” 133:16-17)? Are these Eternals to be identified with the Council of God? The authors state simply that they “apparently personify a viewpoint above the main action.” Curiously, the whole question of the nature of Blake’s Christianity is not discussed until the chapter on IX, and the role of the providential agency in the poem is never fully clarified because at no point are the various references to it brought together into focus. But the authors are concerned that the broad structure of the narrative should not be obscured by the details of the symbolism. They emphasize, for example, that the poem can be seen as three triads, each of which follows a similar movement, not only from fall to rebound, but also from instinct and imagination to passion and then reason; and they stress that the middle movement of the poem (Nights IV to VI) can be seen “as a single action at the same time as a set of alternatives,” as the birth of Orc and the incarnation of Urizen are virtually the same event. By continually outlining the larger units of the narrative, they really do manage to give the reader a vivid sense of the general design of the poem, and even more important, a sense of the coherence of that design. The authors’ feeling that the poem seems to exist without a context is reflected not only in the organization of their study, but in their interpretation. They emphasize the “psychodrama,” and give less weight, relatively, to the social themes of the poem. (This tendency may have been encouraged by thinking of VIIb—a Night in which references to contemporary history are particularly in evidence—as an appendage, rather than an integral part of the narrative.) A consequence of this tendency can be seen in the following passage from the commentary on VIIb: “Blake . . . allowed a hope to survive that somehow, perhaps through some loophole of events in the world, the human community would eventually be renovated. That would be a bonus, however—a something added after the true kingdom of God which is within has been sought and found. One must do first things first: start with the inner man and then let Demogorgon, the necessary or at least hoped-for logic of events, work as he will.” This is too tentative and arbitrary for the Blake of The Four Zoas. In the ninth Night there is surely no suggestion that the renovation of the human community and the coming of the kingdom of God are separate events. One of the ways in which the authors seek to reinforce a direct response to the poem is by adducing “analogies from personal and familiar experience,” intended as stimuli rather than definitive explanations, to help bring the poem alive. One instance here must stand for many: Blake’s phrase “the Sciences were fixd” is explained by referring to the behaviourist whose thinking becomes rigidly conditioned by his own adopted methods—an example which quite typically clarifies both the meaning and relevance of Blake’s thought. Just occasionally, the authors’ wish to bring the poem home gets the better of them: the claim that the sustained agricultural metaphor in the last Night is “virtually a practical handbook on farming” would raise a few eyebrows in my home village. If we read these lines properly, we should be aware of the importance of their sound: the open vowels, the avoidance of harsh consonants, the begin page 266 | ↑ back to top various kinds of repetition (including cadences: “sorrow and care,” “wandering stars,” “vast unknown”), the slight but grating insistence of “division”—a combination of effects which creates a hypnotic mixture of awed admiration, regret, and even, at the end, relief. A poetry of genuinely mixed feelings which eludes any simple paraphrasing, and makes the most sophisticated exposition seem crude. As the authors rightly point out, “Any attempt to say what The Four Zoas means hinges on the even more fundamental question how it means.” It is a question which they consistently keep in mind, and their book benefits accordingly. For this reason the book should fulfill its perhaps modest purpose of intensifying the effect of the poem for all readers, and it will certainly help to smooth the way for new readers. It is generally lively, well informed, and it is sufficiently detailed to keep the reader afloat at all stages of his journey. It leaves the unanswered questions, however, unanswered.